My hair has been through a lot in the part few years.. from brown to blonde to ombre, back to brown, back to blonde, lavender, ombre.. and finally back to brown. Let's just say my hair was quite fried. Luckily my hair has been growing out healthy strands fast, so the ends are all that's in need of help. 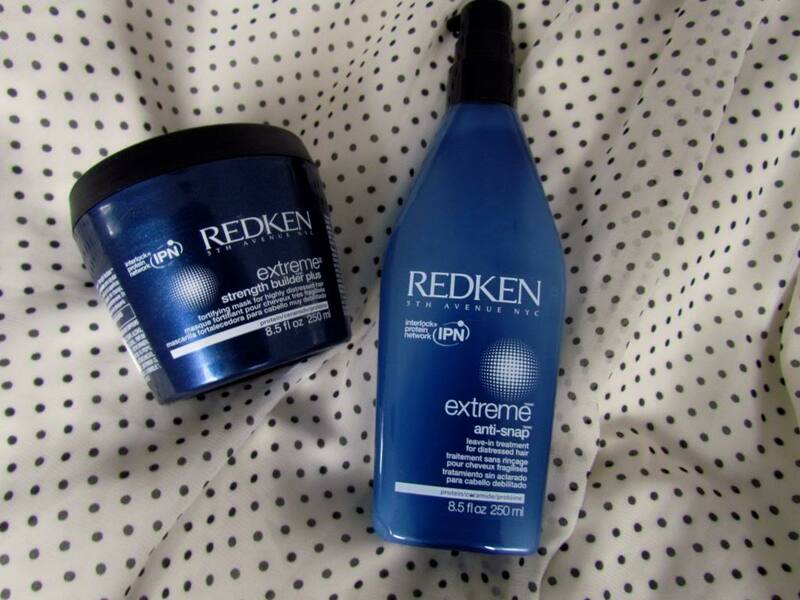 These two products are from the Redken Extreme Hair Strengthening Product line, and I can't rave about them enough. I have tried a lot of hair masks, mostly drugstore brands, and this tops them all.. but then again so does it's price-tag.. nonetheless, this product is for sure worth it if you're hair has been chemically damaged, or your ends need some extra care. For a while I loved this product so much I was using it as a conditioner each day, once my hair gained back its strength with the proteins and other goodies this mask was giving my hair I was able to start using it weekly. I spread this product through mostly the ends of my hair while in the shower and carry on with other things for around 5 minutes. Once it washes out you can feel the improvement in your hair right away. This product is one of the few products I'll call a miracle. I have tried SO many split end hair treatments, and yes some were helpful but this.. this is amazing. I get out of the shower and towel dry my hair a bit, then use about 4 pumps and rub it all through the ends of my hair. It does not leave my hair remotely greasy feeling, and you can literally see the difference in the ends of your hair after one use. It strengthens your hair by not only protecting it from heat but stopping breakage with hair brushing. I can't recommend this enough.